To the outside world, Houston might seem like a never-ending series of highways and high-rises, but it has its fair share of photogenic corners. From its many green spaces to its pervasive street art, the Bayou City offers a ton of great spots worthy of filling your Instagram feed. Some of the city's best street art is located at the site of an otherwise nondescript series of parking lots east of downtown. There's no sign announcing you've arrived at the space locals have dubbed "Graffiti Park," but you'll know it when you see it. Huge murals wrap around buildings, between fire escapes and dumpsters, in an impressive array of graffiti and artwork as diverse as the artists who put them there. Some speak to a larger message of social justice; others are simply elaborate expressions of artistic prowess or just plain fun. Many of the pieces are the product of the HUE Mural Festival, an annual event launched in 2015 as a means to add a little color to Houston's downtown. Dozens of artists from Houston and throughout the globe are selected to paint their murals during one week each fall. While some murals are painted over to make way for a new piece of art, many have carried over from year to year. Located on the edge of Hermann Park near the Texas Medical Center, McGovern Centennial Gardens offers a more natural backdrop for professional and amateur photographers alike. The focal point of the gardens is a spiral-path hill with a cascading waterfall down the front that visitors can climb to get an overhead view of the park. With its collection of benches, sculptures and water features, this spot is also a popular locale for engagement photos and other staged portraits. Its colorful rotation of blossoms and year-round lush green bushes lining the paths make for some gorgeous macro shots. Look carefully, and you're sure to spot a lizard or bee that won't mind a stealthy close-up. Hours for the gardens vary depending on the time of year, but they are typically open during daylight hours. Make a day of your trip there by grabbing a bite from a visiting food truck outside the front gates or packing a picnic, and sitting down on one of the many tables and chairs set up near the large, main fountains. Easily one of the best museums in Houston, Houston Museum of Natural Science is home to a diverse collection of ancient fossils, colorful gems, Egyptian artifacts, wildlife specimens, and a mesmeric Foucault pendulum—among other exhibits. Dinosaur claws, Fabergé eggs, top-lit ammonites—what's not a great photo opportunity at the HMNS? In addition to the stunningly beautiful permanent collections, the museum also houses a multi-story indoor butterfly garden with tumbling water features, rich vegetation and, of course, lots and lots of butterflies. While you shouldn't touch the insects in the garden, some aren't afraid to land on or near you—making for some gorgeous shots you might not capture anywhere else. Another public art space off the beaten path ironically sits within view of one of the busiest—and drabbest—highways in Houston. Situated just off of Highway 288 southwest of downtown, this small stretch of grassland holds more than a dozen metal sculptures large enough to be seen easily by drivers whizzing by. The collection began with the purchase of a single hippo sculpture, bought to sit on the edge of the adjacent pipe yard. The piece would later be joined by a rhino, then a Snoopy flying a plane, and so on. The metalwork sculptures have since become a favorite among Houstonians commuting along the route. Eclectic Menagerie Park is technically located on the grounds of Texas Pipe & Supply's distribution yard, though the artwork is accessible to anyone driving along the feeder. Pull over to snap a selfie with a giant spider, gawk at a wide-winged owl, or play air guitar with a mariachi band. For avid food-stagrammers, it's hard to beat the Common Bond Bakery. This Montrose-area mainstay has tons of natural light that's ideal for photographing any one of its many tasty treats. From its gooey, Gruyere-filled Croque Madame to its flaky cherry croissants, every bite is as attractive as it is delicious. Top it off with an expertly crafted latte, and you'll be #blessed. Not that your meal is the only thing worth a snapshot or two. The cafe itself is filled to the brim with vivid displays. It's brightly colored macarons, overflowing bread loaf baskets, and elaborately decorated cakes are sure to garner a like or two of their own. The entirety of Smither Park is adorned with a diverse set of elaborate mosaics, created using a mix of recycled and reclaimed materials and created by local artists. The effect is almost whimsical, and there's no shortage of interesting photo ops. The park's primary feature is its Memory Wall. Spanning a whopping 400 feet across the park, it includes dozens of unique panels made from pieces of broken ceramic, bottle caps, seashells—even license plates. Each offers a unique backdrop for a portrait or selfie. Other interesting sites in the park include a covered stage for live performances designed to look like a brightly colored anglerfish with its mouth wide open and a series of bright-red porch swings that are fully functional for those great live-action shots. The park is a living gallery, with artists adding their own artwork each Saturday throughout the year—so there's always something to knew to hashtag. Bayou Bend houses the Museum of Fine Arts, Houston's collection of decorative art and paintings—so naturally, it is one of the most beautiful sites in the city. Between the antiques and embellishments inside the house and the gardens outside on the grounds, there's no shortage of photo opportunities—no filter needed. Come winter time, the house and grounds turn into a holiday-themed wonderland, complete with fake snow, lights displays and live reindeer that's not to be missed. You can take photos any day that the grounds are open—though no flash or props are allowed, and any pictures you take can only be used for personal, non-commercial use—but Saturdays, in particular, photographers are welcomed to take photos of the gardens. Just know that standard admission fees apply. If the only rose you want to post a pic of is bedazzled on a jean jacket, then Retropolis might just be your happy place. This 19th Street Heights staple is one of the best resale shops in Houston. With its multi-colored exterior, you don't even have to step inside to snap a great pic—but it's definitely worth it if you can. Inside, you'll find densely packed treasures from the past several decades. Snap a selfie in some stain-washed skorts, and rock that #retro hashtag. Between the cowboy boots lining the stairwell and the racks upon racks of vintage apparel, you'll have plenty of inspiration. 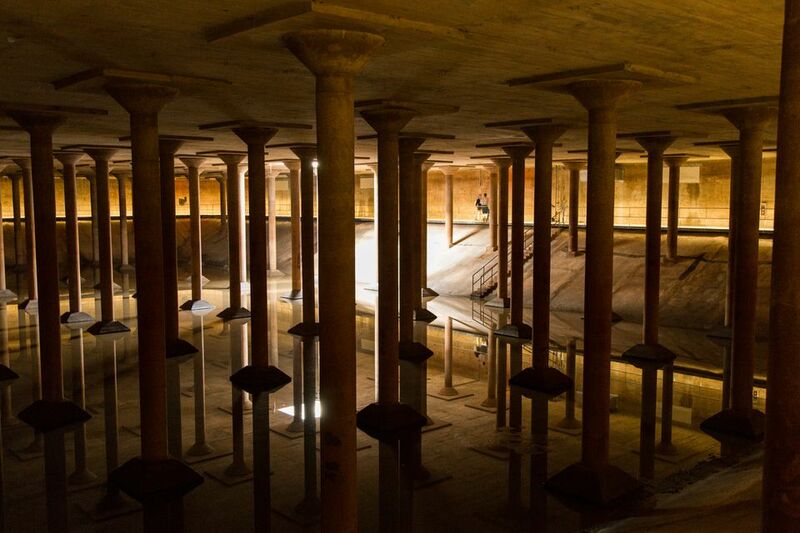 The Buffalo Bayou Cistern lurks beneath the surface of Buffalo Bayou Park near the old Water Works building. This expansive cavern is so large it takes 17 seconds for an echo to bounce back to you, but its the hundreds of 25-foot columns that make for eery-yet-stunning photos. Originally built in the 1920s, this space served as part of Houston's municipal water system for decades before a leak caused its decommissioning in 2007. The cistern was reopened as a public space almost a decade later. Half-hour history tours are available Thursdays-Sundays, but if you'd prefer to use a tripod in the low lighting, you'll need to instead opt for the one-hour photography tour, available on select weekend days. Regardless of when you go, be sure to book tickets in advance, as reservations are required.